Headlong and Fingers Crossed: Exploring Japan Vol. 23 - Fun Foods! Exploring Japan Vol. 23 - Fun Foods! So for almost half a year, we've explored a ton of different places to go and things to do in Japan. One thing that we've failed to discuss is the food. Now, everyone knows about sushi and ramen and gyoza. I'm not going to spend any time talking about the normal stuff. The fact is, if you go to Tokyo, those foods are everywhere and most places are very good. Definitely go to the fish market in Tokyo if you have the time. You can hit up the stands outside the market proper and get some of the freshest sushi you'll ever find. I had uni (sea urchin) that blew my mind and it wasn't just a little bit on some rice. It was the whole urchin, prepared and given to me with a small spoon, all for about $8.00. The flavor was nutty and salty and unbelievably fresh. Another fun thing are the Japanese bakeries. They're a great place to grab a bite for breakfast or lunch. You'll find them everywhere and they serve up plenty of fresh breads and muffins, some in fun shapes and with meat baked into them. Still, that's not really what I meant to write this column about. You see, Japan has some of the best snack food places under the sun. You can find a ton of them in Harajuku and they're well worth exploring. The most well renowned potato chip company in Japan is Calbee. You can find their chips in most stores, however they also have stands in some malls. The first one we visited was on Takeshita Street in Harajuku. There you can order your chips fresh and ask for a variety of flavors. They will slice the potatoes, drop them in the oil, dry them off and present them to you with the flavor of your choice drizzled over them. With these, we were going for a salty sweet flavor so white chocolate, salt and mocha powder was the order of the day. You could also get many other flavors including maple syrup and even ice cream on the side. Their fries are also very, very popular. Takeshita Street is known for its crepes. There are at least four stands like this one on that small stretch of shops and all of them look amazing. Go early because they do tend to run out of certain ingredients the later it gets, especially the fruits. This one is insane! 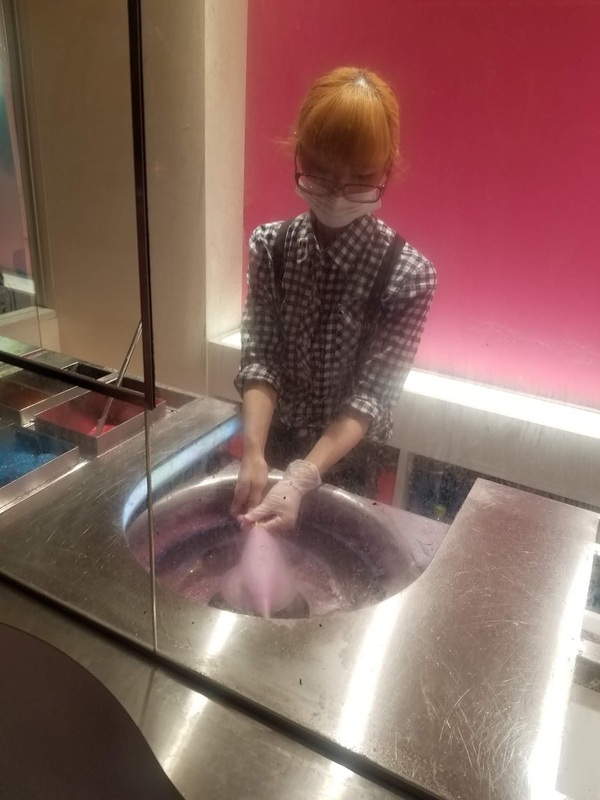 This shop makes cotton candy that is as much a piece of art as it is delicious. Every single layer that you see is a different flavor of sugar. Grape. Apple. Blueberry. It's all there and to be honest, we loved all of them. The woman who built this gorgeous beast even stopped midway through the first one she started and threw it away. It did not meet her standards so she started again. Anyway, Harajuku is definitely a place you should go to just for the people watching, but while you're there you should indulge yourself. You definitely won't find anything like this anywhere else! Exploring Japan Vol. 24 - Funny Stuff! A Debt to the Dead - Free!